Sometimes somebody tells your truth, and you didn't even know it was your truth until you heard it, or in this case read it. That's how it was for me with this quote. With one of those blinding flashes of understanding I understood the sometimes contradictory nature of my life. I am a hermit. I am a wanderer. In the simplicity of this quote I found my reality reflected, and understood how I am. I am a hermit - I come home to the mountain and sit happily at home pottering, going not many places, seeing not many people. I crave the quiet and the solitude that the mountain gives me. I find my centre here. But often when I am home, I dream of visiting other places, of seeing new and wonderful things and travelling the world, and our country. I am a wanderer. I love a road trip - just getting in the car and driving. The conversations we have as the hundreds or thousands of kilometres fly past; the new ways in which see the world, experience it. All of these give me a sort of wanderlust. But even when I travel, I remain hermit-like. Large gatherings are not for me. Days filled with activities followed by nights with shows and parties are beyond me. I travel for new experiences; yet carry a sense of solitude with me. I will always need a quiet place to come home to at night. To reflect and ponder. To re-charge my batteries so that I can truly enjoy and appreciate the wonder that is there for the wanderer to experience. This image captures the dichotomy for me. 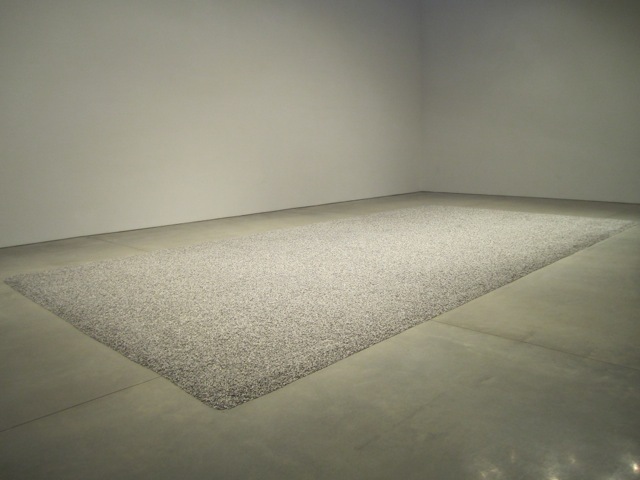 I travelled the world to see this piece - sunflower seeds by Chinese artist Ai Wei Wei in New York; and found in it the truth and beauty of solitude. To be in that room, with just the ceramic sunflower seeds and me. And Barry. A pair of wandering hermits. The quote defies attribution. The whole of tumblr seem to be sharing it; but I cannot pin down where it comes from. Whoever you are - thank you. It's always an interesting journey when somebody asks you to do a piece for them. I think I am getting better at it - trying to ask the right questions, checking that we are seeing or thinking along the same lines, testing ideas early and then pretty much just getting on with it. A friend recalled a piece of mine she had seen several years ago and we were trying to remember just what it looked like. I was at dinner at another friend's house and remembered he had bought it, so I asked if I could borrow it back to show the commissionee. That was lucky - I had not photographed it before selling it - my bad. 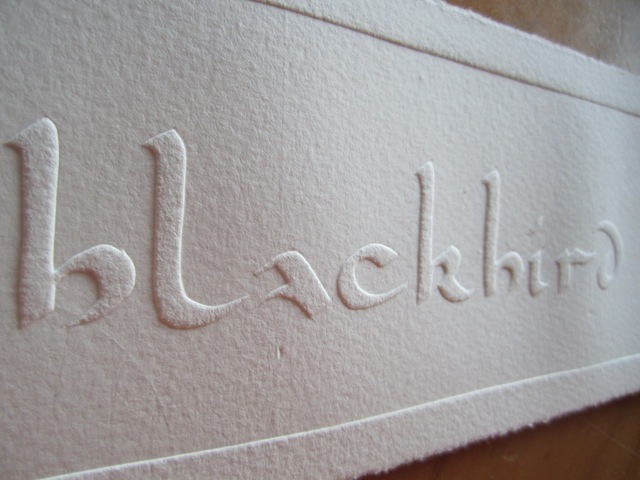 We knew she wanted it embossed; on a concertina fold coming down the piece, so far so good. 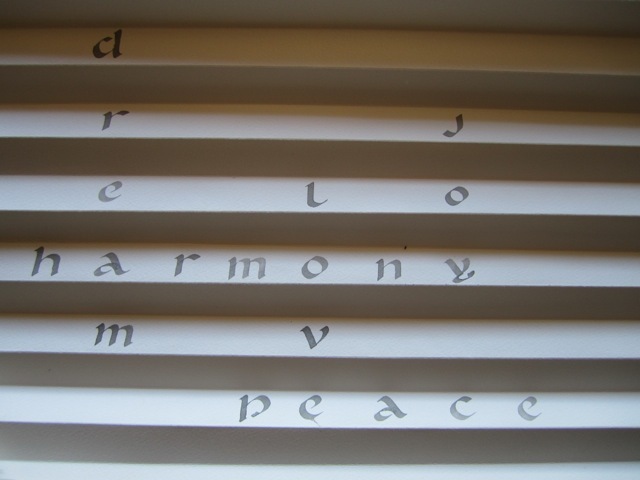 She brought along ideas about having the words go across, come down and be read both vertically and horizontally. So off I went. I had to do a lot of maths. I knew the depth of the frame that our local framers had; and I knew that the height of the paper when folded had to be less than this, because we also need to include mat board and the glass, so way out of the deep dark recesses of my mind I pulled some trigonometry and worked out how high the fold could be and therefore how wide each fold was and how far apart they could each be. Seriously left-brain work for a creative! 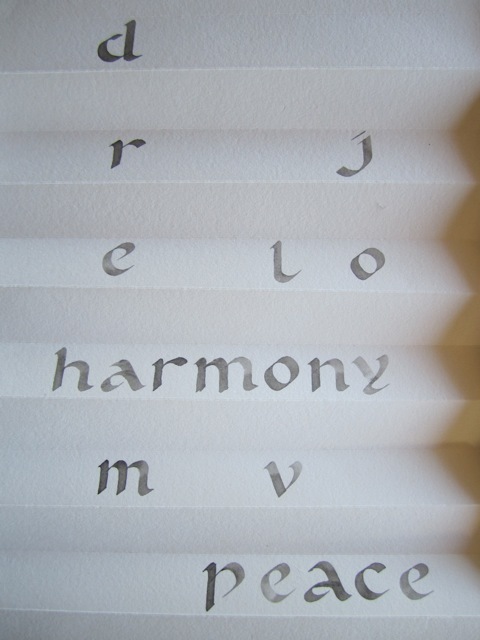 The first time I wrote it out I felt that it was unbalanced because of the big gaps between letters for the vertical words due to the concertina folds (we knew we needed the letters on the top of the concertinas to enable it to be read if hanging on a wall). So I wrote the horizontal words with equal space to match the vertical words. Although the words looked better balanced in a way, this made it rather enormous, so I rang her and suggested she pop over and see what she thought! We agreed it wasn't working, and in particular, she felt that the vertical word letters were kind of hanging there, unrelated and it took a while to work out you should read down not across. We joked about "elo elo elo..."
So then the re-working began; which words would we use; how would we lay it out if we didn't use a crossword approach and so on...but that 's a story for later down the track. It's part of the process of trying to work with somebody to achieve what they had held in their imagination or mind's eye and translate that into something can be realised. 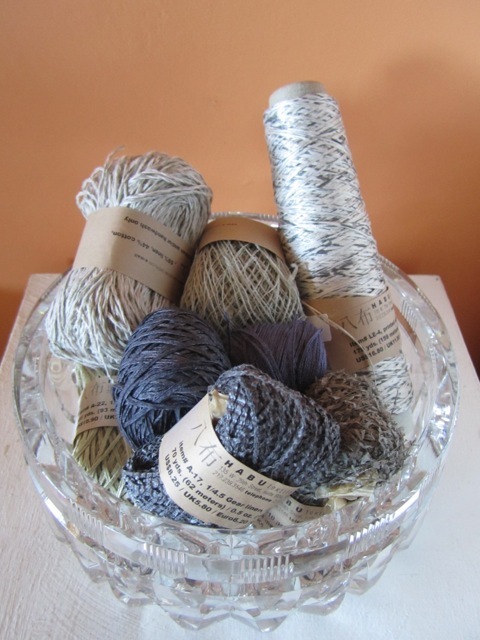 I seem to be heading in several directions at the moment, with lots of different projects on the go. I have two commissions I am working on; and these always take a lot of time, working thru the options, figuring out if you're on the mark or not, double checking and triple-thinking. 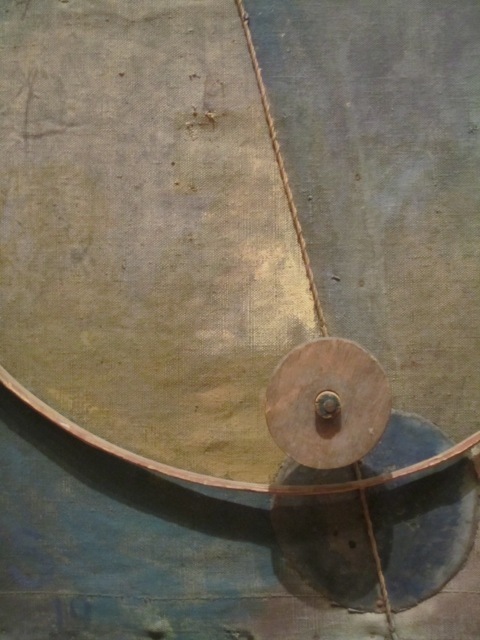 I also have an exciting opportunity coming up as a featured artist in an a exhibition; and the curator spent some time with us this week looking at work and making selections. 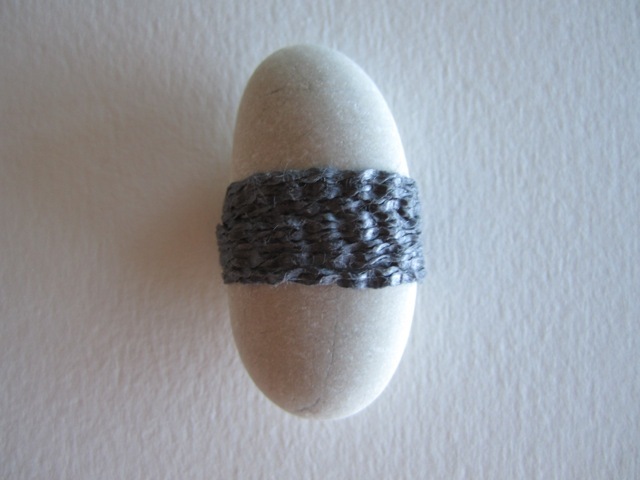 I continue to potter away at my letters for A Letter a Week; and I have been wrapping pebbles whenever I needed to stop thinking and just do. Here are the next four letters...sitting nice and quietly as they do. 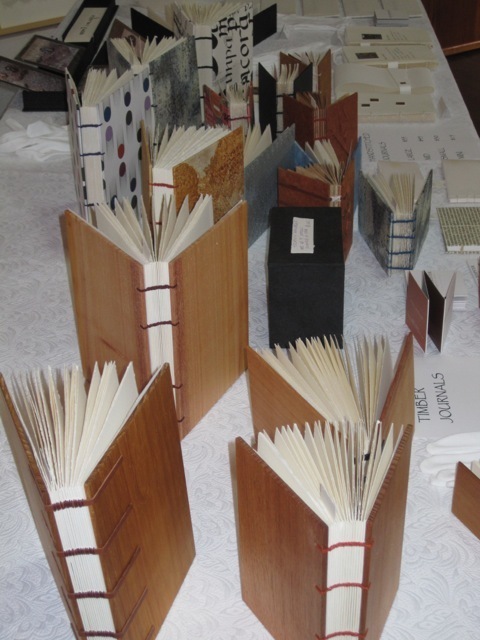 In amongst it all I have also been continuing to work on the pages of the book I made at the Glen Skien workshop a month or so ago. 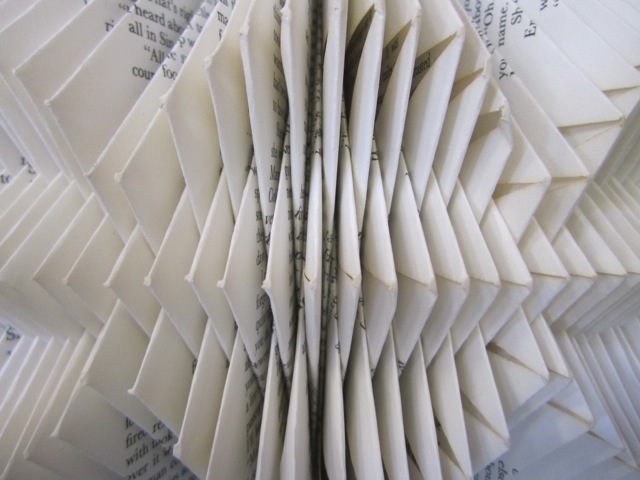 Whilst I enjoyed the whole day and the experimentation; the pages that I ended up with weren't quite 'me' in some way. Generally I am a 'less is more' kind of gal, and yet for some reason, the pages demanded to be worked on again. Even after they had been stitched into a book! I kept the book on some newspaper on a bench and each day dribbled some ink over the pages - nothing too dramatic, just something with a bit of strength and character. 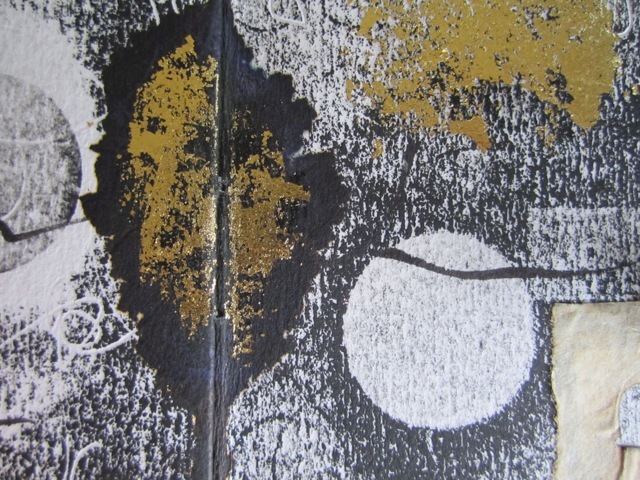 Then later this week I chose to apply some of my scraps of gold leaf in places. I like that the pages are a bit more multi-dimensional now; they seemed a bit flat to me before or something. Anyhow, it's edging closer to being finished. It will always be a wonderful workshop reminder book; and a reminder of the challenge for me to keep working into something, when I usually want to stop way sooner. This quote tends to suggest to me that if you are concerned only with trying to be unique, different, original or individual you almost can't be. Almost as if the focus on it will betray you and you will end up trying to do or create something that is already somewhere. I think his expression that if you are simply trying to tell the truth, in your own way, you may well end up begin original is lovely. If you focus only on what needs to be told and express it through your own hands, stitches, inks, paints, words, marks or whatever, then there will be originality within it. It probably comes down to the truth bit. If you are being honest and attempting to speak a truth as you know of it or perceive it (not copying somebody else or trying to imitate somebody else or 'tweaking' somebody else's ideas or working between parameters established by others) then the work you produce will be truly your own. It matters not that you are not the first person to speak or tell the story of "memory" or "environmental degradation" or "discarded"or "silence". It matters that you are the only person to be doing it in your own unique way, based on your personal truth in relation to it. 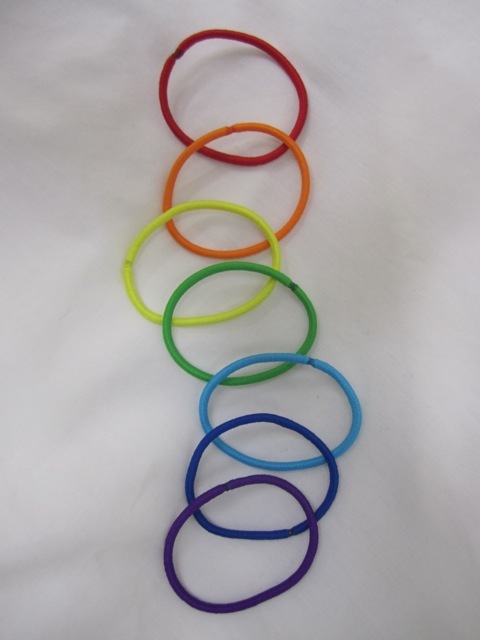 Rainbow rings or cabin fever? I don't usually blog on Wednesdays, but these images made me smile and brightened my day. We live on a mountain and it has been shrouded in mist most every day for a week; showers scudding past; clouds drifting up from the valley; occasional moments of sunshine. My little project 'the unbearable whiteness of summer' has had a real kick along; even if it's now autumn, and I might need to re-think the title. 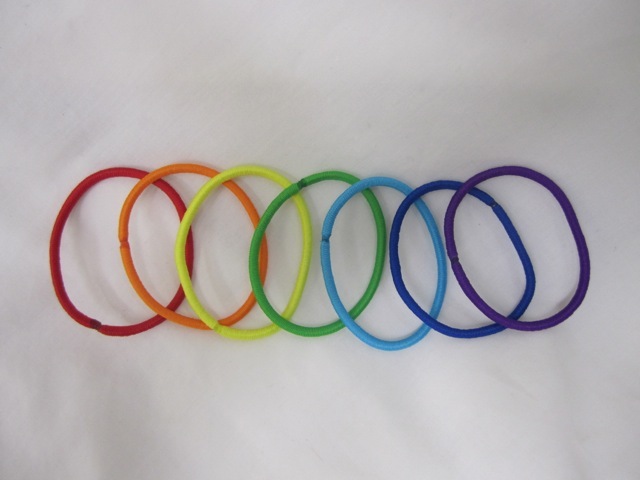 And given its an Olympic year and all - I liked them as the Olympic Rings (plus)! So nothing particularly artistic; just a bit of light fun on another grey day. I had a lovely play a week or so ago. 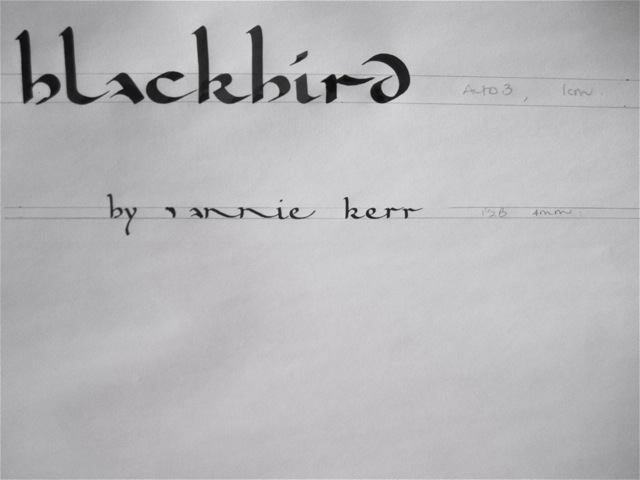 I came across Annie Kerr's (Inkhaven) poem Blackbird in amongst my goodies on my table and just wanted to sit down and play with the words, write it out and see what I could do with it. 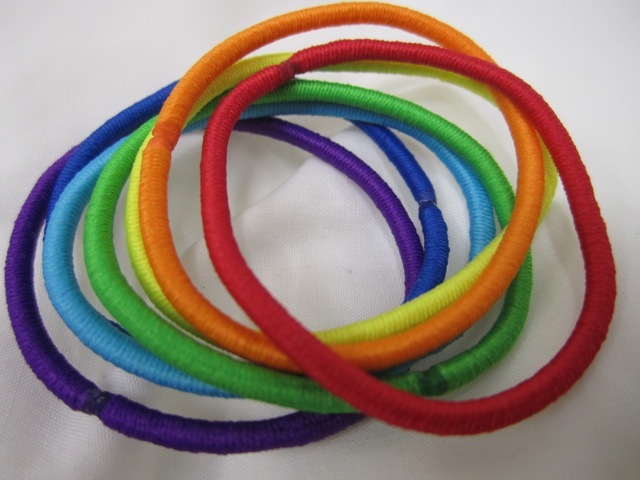 I headed off with gay abandon - you know those times when you have no expectations of yourself or a piece - you are just interested to see what happens next or where it takes you? I went along for the ride and ended up with two lovely little bookish pieces. 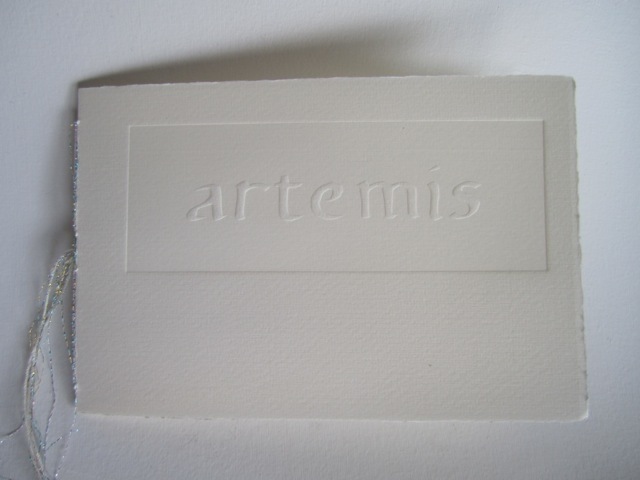 Being the total white on white fan and a lover of the embossed word, I decided to make the cover an embossed one. 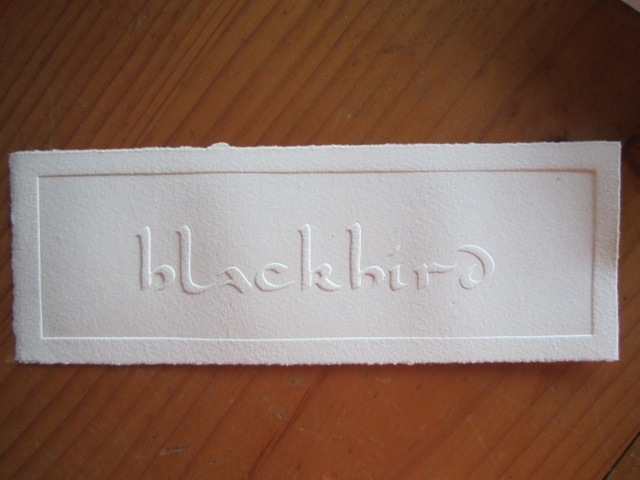 Then I got out a piece of my very expensive embossing material. Not really. I simply trimmed a washed-out milk container down to the right size. 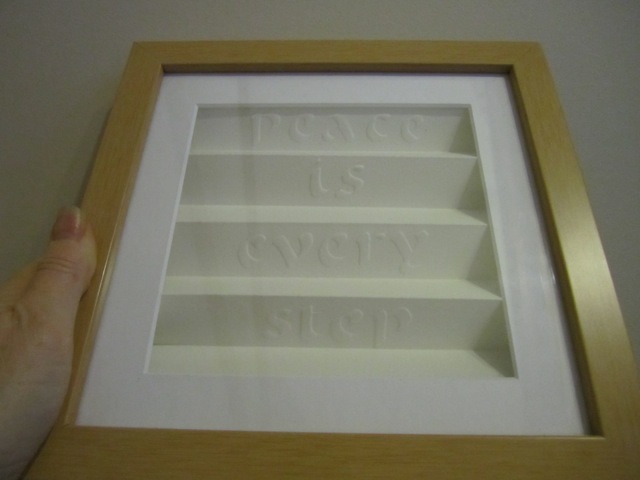 It's a great way to re-use the plastic, it can be cut, and it can cope with a press. I nearly always have a stash of blank bits in a drawer in the studio just in case I get inspired and need to emboss in a hurry. 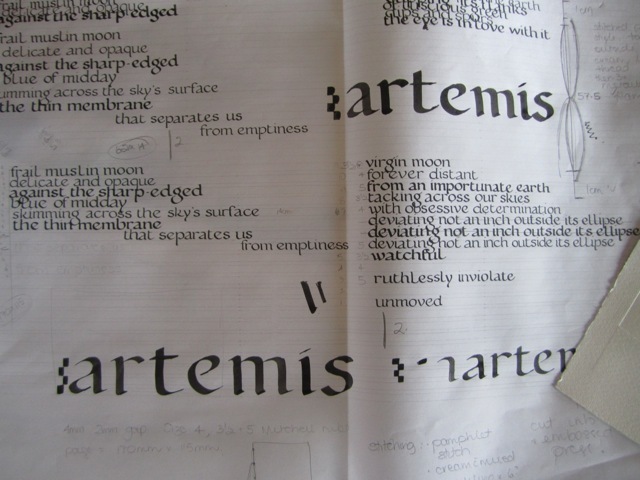 The next step was to trace over the word in a black pen. Another wonderful characteristic of the milk containers is that you can trace because they are see-through! Quickens things up a bit. 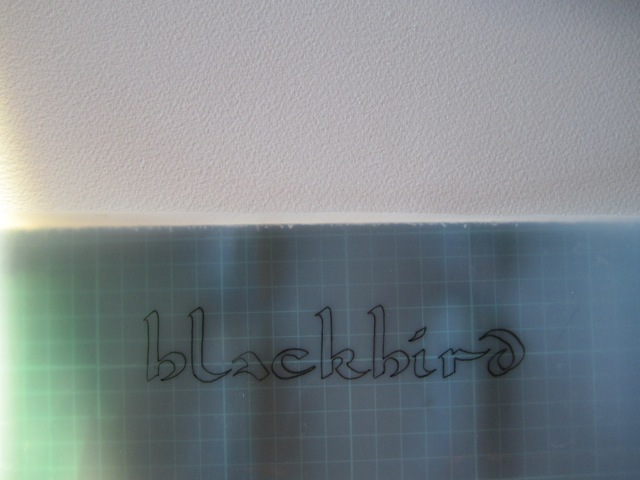 I sat with my trusty exacto knife and scalpel-like tool and cut away the letters. I thought I was finished for the day at that point, but couldn't help myself. 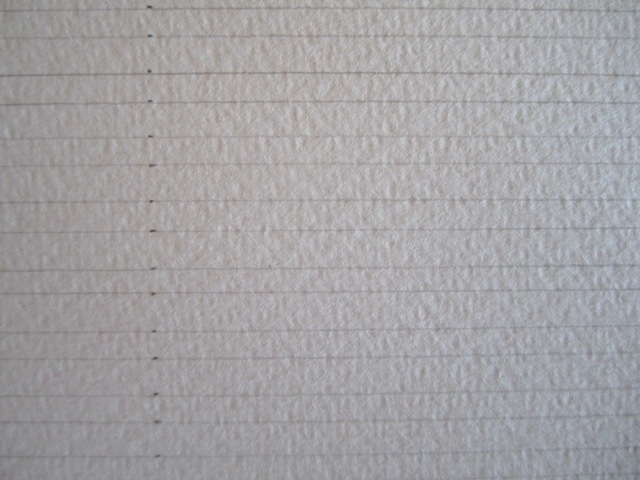 I quickly dipped some test paper in the sink, patted it dry and ran it thru the press. Of course, as the sun set further I just had to get the two covers done and I did. Don't you love that texture? 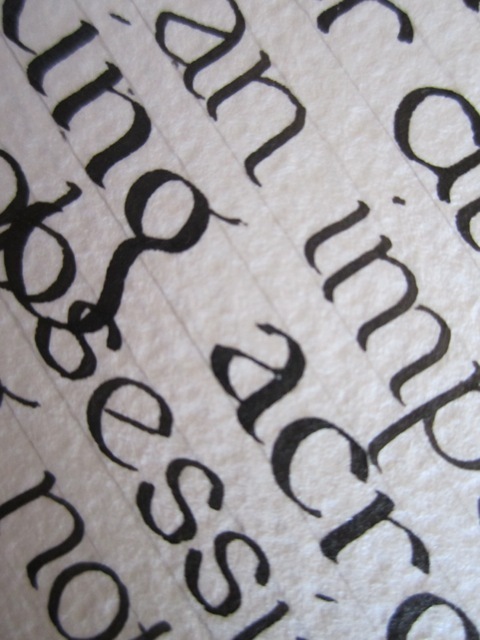 I used Arches Velin paper which has a beautiful velvety feel. 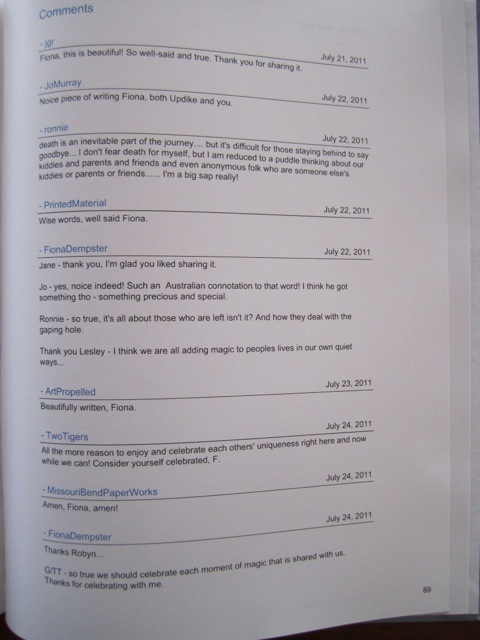 I got permission from Annie to use her words and sent her a copy and kept one for myself. I'll never know how or why I begin to wander along a path and then seem to find more and more things that connect with it. It's almost like an awareness of something then makes it possible for other associations to be made with it; or perhaps there's some sort of subconscious magnetism going on where things are drawn to each other. No matter how or why it happens, I am eternally grateful that it does! Its the pebble thing. 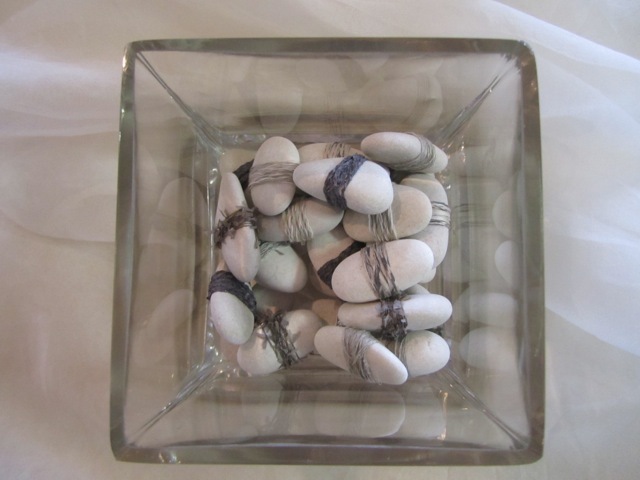 I began wrapping pebbles last week and in my odd moments, when I had no better thing to do, I kept wrapping them. They are now beginning to fill a square vase that I have, and I am enjoying watching the stash grow higher. 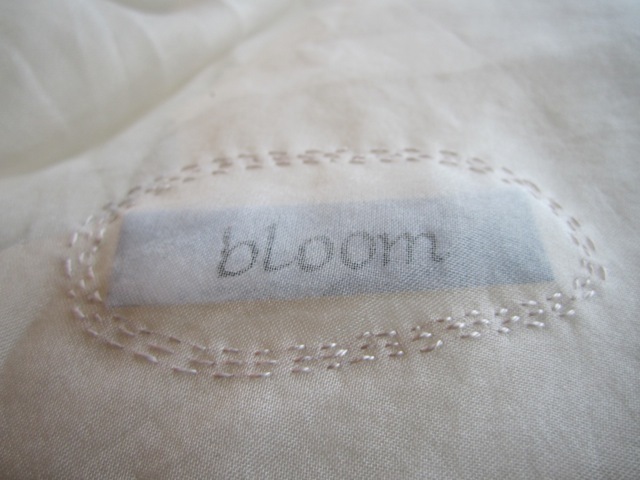 Of course this then triggered me to pick up the words I had been practising my italic on a while ago; and go find some organza from the cupboard (and even iron it a bit!) 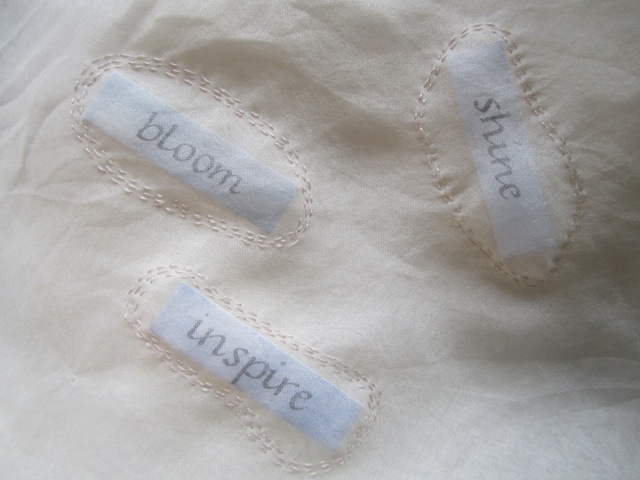 and then start hand stitching the words into pebble shapes. Or at least that's how they appear to me. 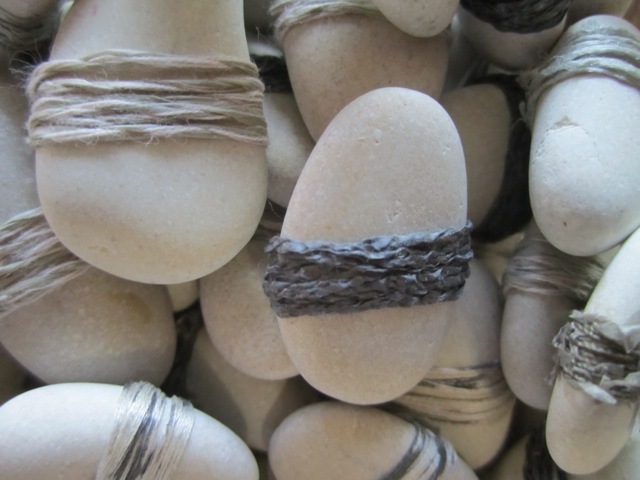 I am pondering what to do with the fabric once I have stitched enough words into it - but for the moment I just like the pebble forms. This really tickled my fancy so to speak...and seemed like such a great way to describe the squirm and discomfort I feel whenever anybody asks me for my favourite books. Books become favourites for all sorts of different reasons, and at different times. I often find myself being almost incoherent when I try to describe why I love a book so much. I find it hard to express how it moved me or made me feel; without sounding a bit unhinged. Book Group helps me focus my thinking and marshall my arguments around why I liked or didn't like a certain book; but the ones I love...they are much harder to speak about. Our favourite books are part of a whole life of reading; most of which, for me, has been great. Our favourite books are unique and can't easily be compared. We may love them for their beautiful writing and descriptions, or for their characters which we identify strongly with; or for the story that transported us away; or for their validation of an important point; or whatever. 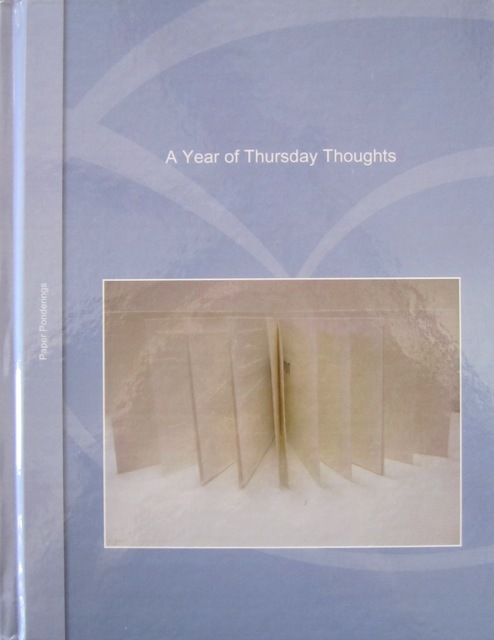 As Barry and I were kind of planning our art year ahead - what we wanted to do, what we wanted to make, where we wanted to show etc, one of the things we discussed (at Barry's suggestion) was the making of a book based on my series of Thursday Thoughts. For some reason two weeks ago I sat down and organised to do it - totally surprised myself! And two weeks later to the day; here in my hand is a copy of my book. As ever with online publishing, you don't get total control over the look and feel; but I think it worked out well despite that. 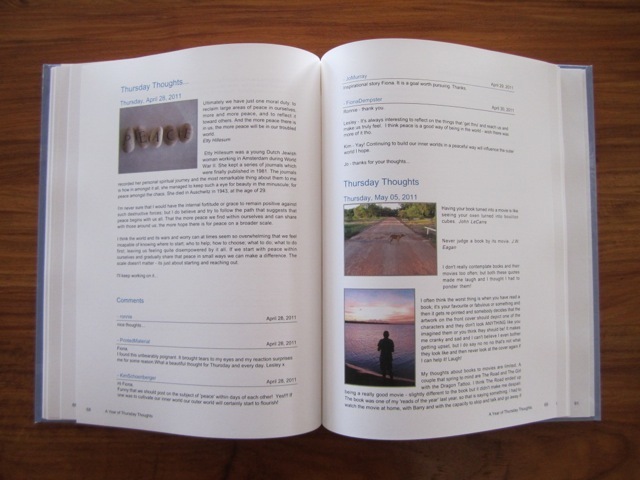 The paper feels great; it is well-finished; the clarity of the photos is beautiful; and the text is nice as well. 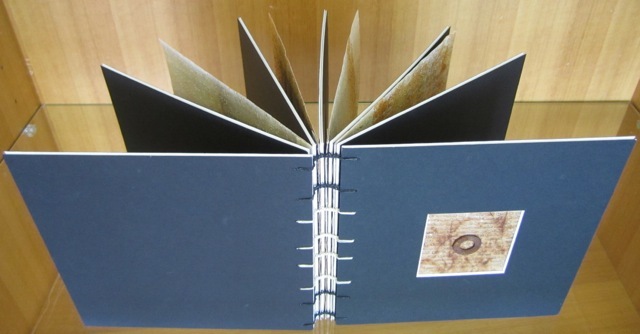 I used shared book's blog2print platform and was very happy. It was easy to use and it gave you options (like choosing a timeframe - posts between such and such a date; post with such and such a title) which some others didn't. A 20 page soft cover book starts at $14.95; a hard cover at $24.95, and extra pages are 0.35 cents each ($US). I bought two this time around, but I can buy more if the desire takes me! Update: I have learned that only I can buy the book and that each book has 'not for re-sale' printed on it; which strongly suggests you can't sell it commercially or sell it on. So my book is for personal use only. I think this is called the dedication - I think of it as an introduction. It explains that I have included all the comments people made in response to my Thoughts; so that you can feel the personal conversational nature of it. This is Volume I, because it contains the first 52. Each anniversary date I will make another one. 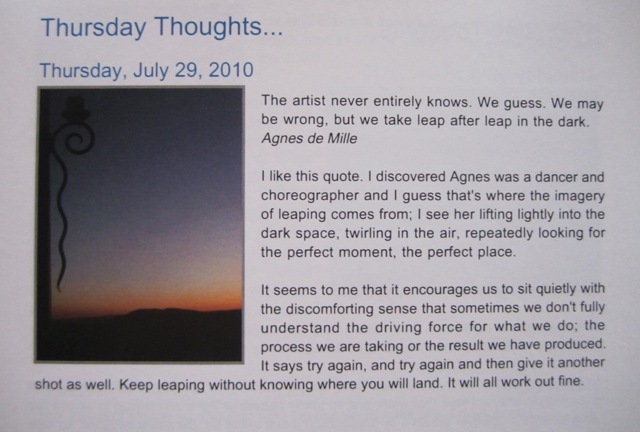 My very first Thursday Thought. A double page spread from last year. 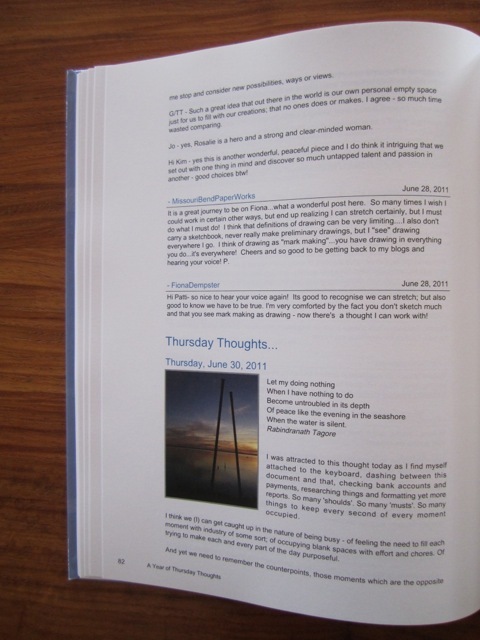 The final Thursday Thought in this volume. I kept the pages bent up because the book is so new and still bouncy, so apologies if it makes you feel sea-sick; but I didn't want to flatten it out just yet! When I received my book and held it in my hands; it felt so right. It felt as if the world I inhabit on the blog had become even more real in a way that matters to me - by becoming a book I could hold in my hand and turn the pages of. I love that all the Thoughts are there together, with the comments and conversations together. They are more accessible this way. 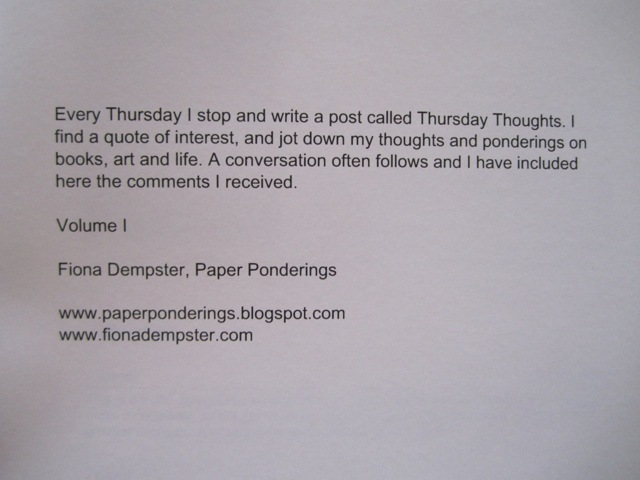 I doubt I would ever go to the blog, click on 'label' and then drag up all the Thursday Thoughts and then scroll and click and open the comments and then go back and scroll and click and do it again, at least 52 times. This is perfect for me and I have enjoyed sitting down with old friends - me, my thoughts and the folk who comment - and smiling. Thank you all for the engagement and interaction that makes for such a wonderful conversation. 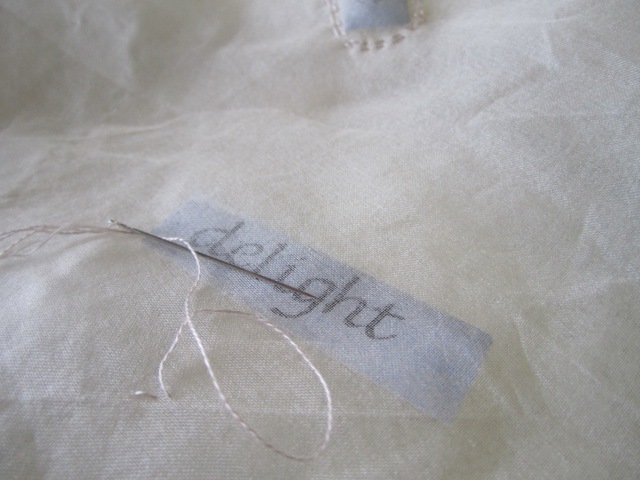 I have had a couple of great days in the studio - working on a small commission, writing out some poetry and playing with forms, embossing bits and pieces and stitching a small book. Nothing much for show yet, rather more the sense of soaking in my right brain, being nourished by creativity and of feeling at peace. 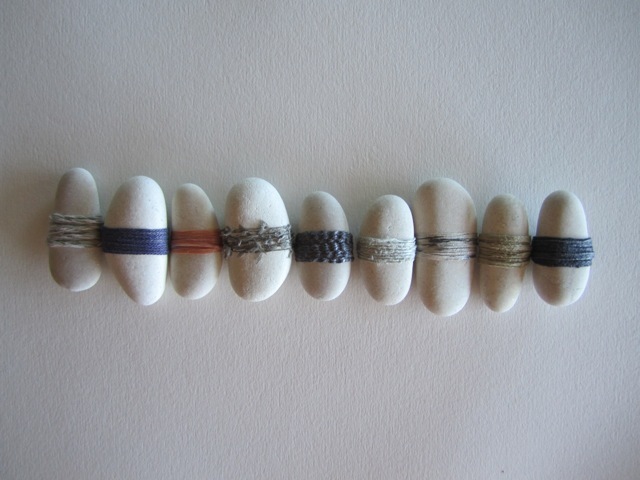 Some of my playing time was spent with my Habu threads and my pebbles. Whilst in New York we had a lovely catch up with another blogging buddy Mary Jane who, like Jennifer braved a train ride into the city to meet these two Aussies on holiday! We visited the Rubin Museum which was filled with glorious and beautiful Himalayan art and Tibetan art. We spent hours together gazing, learning and chatting. Afterwards MJ had asked if we could take her to Habu - of course we could! I really wanted to go back and get more of a stash if I could, so it was my absolute pleasure to have an added reason to visit. After we had drooled at all the loveliness in the shop, we walked back to Penn Station together, and talked about the threads. 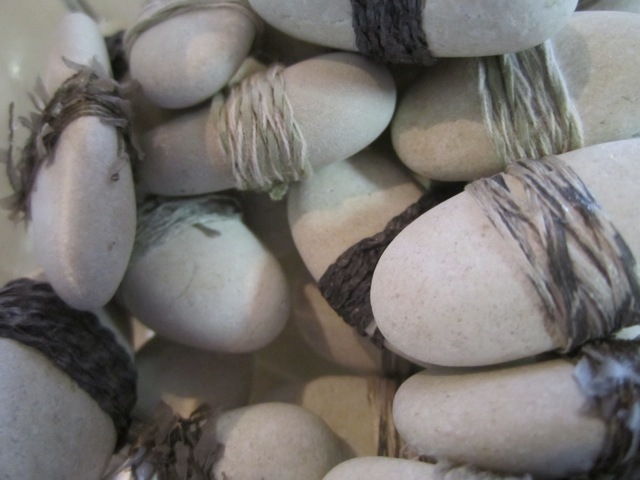 All I kept thinking was I want to wrap pebbles. 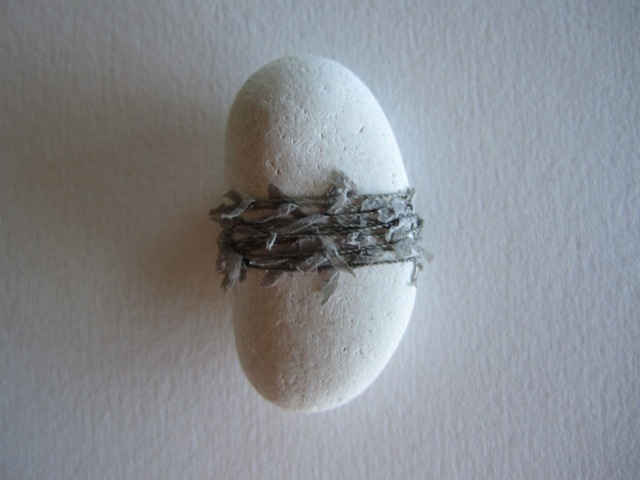 I want to wrap rocks. 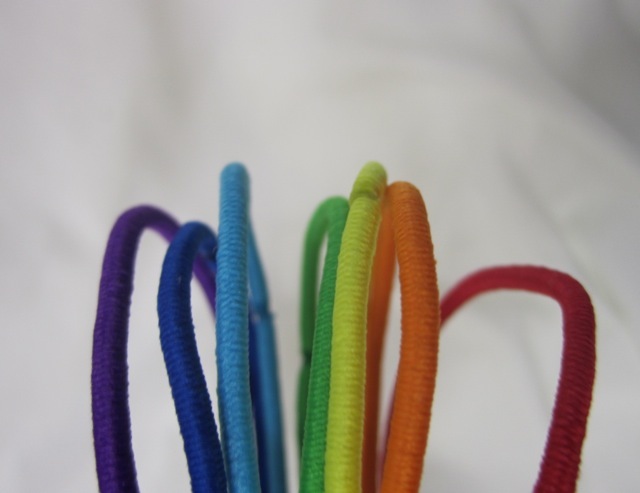 No idea why, but that was the little voice calling to me as I thought about those beautiful threads. So over the weekend, I did. 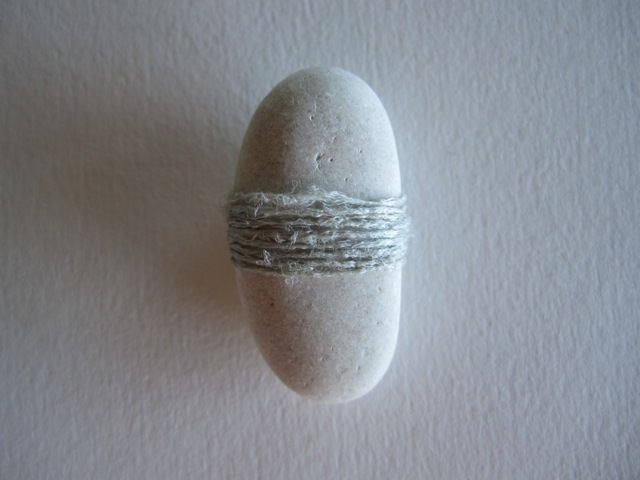 ©2012 Fiona Dempster - Habu threads in bowl. If you want to identify me ask me not where I live, or what I like to eat, or how I comb my hair, but ask me what I am living for, in detail, and ask me what I think is keeping me from living fully for the things I want to live for. Between those two answers you can determine the identity of any person. I almost didn't want to choose this one, because I knew it would make me think. I knew it would make me consider what I am living for and what I think is keeping me from living fully for those things. The big questions you'd have to say. I like the process he suggest here, stopping and thinking about what it is that I want to be living for - what that looks like; how I would experience living my best life; the life I would lead if I could. And then pausing to ask what it it is that stops me. I like that in the first part he asks for details - for ideas, descriptions and passions that really get to the heart of what it means for each of us to know what we are living for. The second part is interesting and again really asks me to really consider things and identify where the blocks are; sometimes an attitude, sometimes about priorities, sometimes about finances. Somewhere in between he suggests, I'll find the real me. 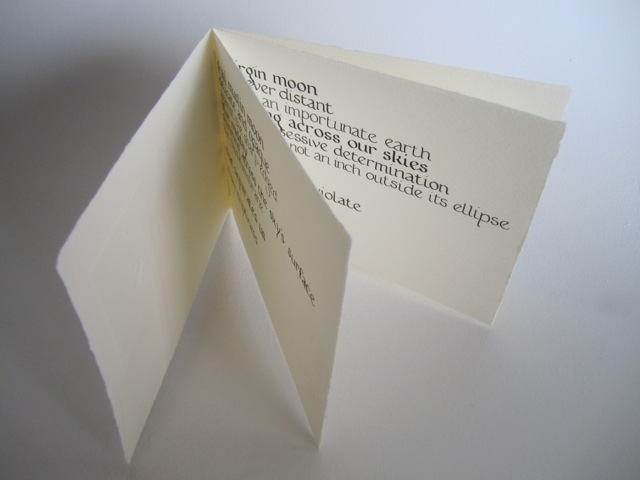 A few years ago I worked with local poet Robyn Nugent on some books about the moon. 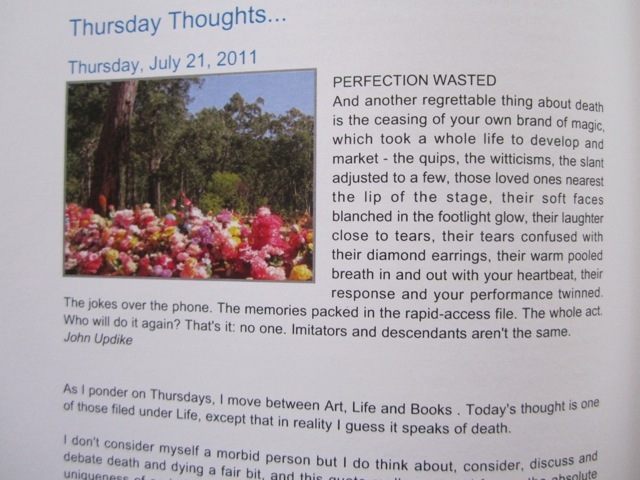 Robyn writes stunning poetry - personal, insightful, observant and at time astringent, but always true and beautiful. 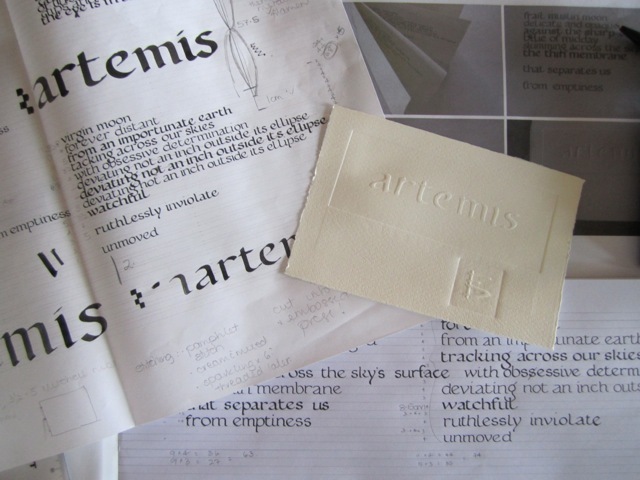 I gave her the wee book I made of her poem Artemis, but recently I thought I'd like to re-make it. 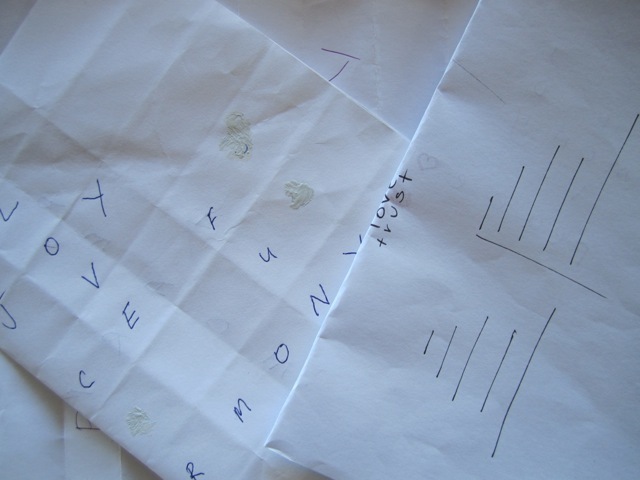 Lucky for me I had kept a page of notes, and I even knew where to find it! I also found some photographs and a trial run of the embossed cover I made. 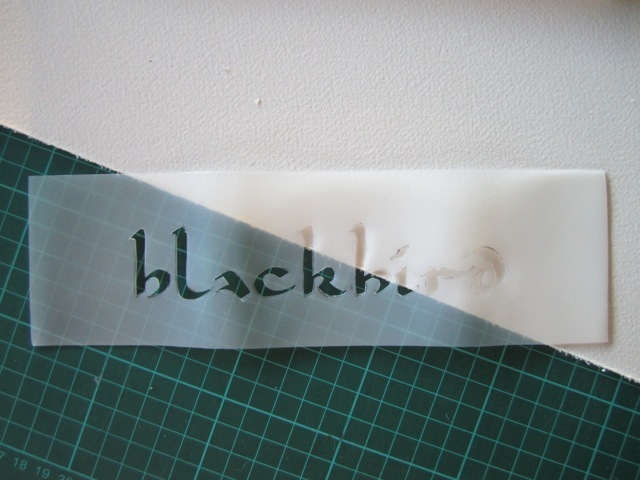 Then the process that is well known to calligraphers world-wide - drawing up the lines - began. I know some folk use light boxes for this, others use pin pricks, other score lines lightly. It all depends on the work you are doing and a bit of a preference I guess. But I sat there measuring and marking lines. And I really enjoyed it. I played with weight variations of Foundational hand, and some spacing for emphasis here and there. 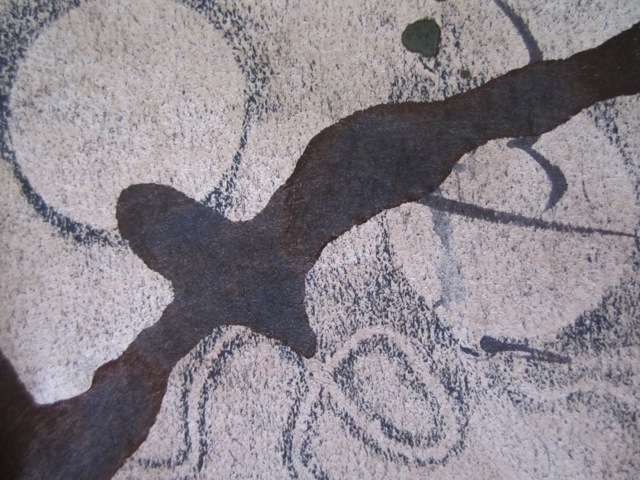 I soaked some paper, blotted it and then ran the embossing through the press. 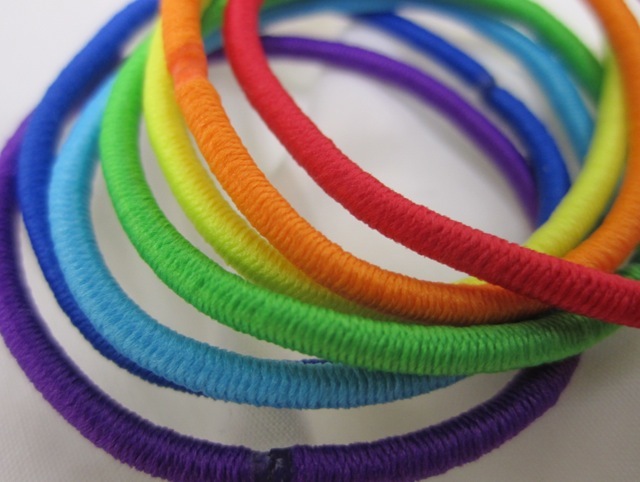 I stitched it with a crochet cotton thread and about six strands of another sparkly thread. And now I have my very own Artemis! This is what I planned to blog on yesterday, but got carried with redness instead; so today we focus once more! I think like a number of blogging buddies, (hello Ronnie, hello Gabriella, hello Trace and others), we live in a town that is very creative and has the artist vibe around. Sadly it is also a bit of an expensive town when it comes to renting premises for art galleries, say. So strangely enough the wonder and success of the town's artists can't be fully shown or fully expressed because of the success of the town - a weird conundrum I think. Fortunately we have Ken and COMA who keeps local artists on the map with regular shows, along with a cooperative gallery and another small commercial gallery. We also have the UpFront Club where they hang a new show every month. And just as importantly, I think, our local Library loves and supports its local artists and always has art on show on walls and and in the foyer cabinets. So whilst there is no longer a community fine arts exhibition space, we do have plenty of opportunities and the town gets to show off its assets in a way. 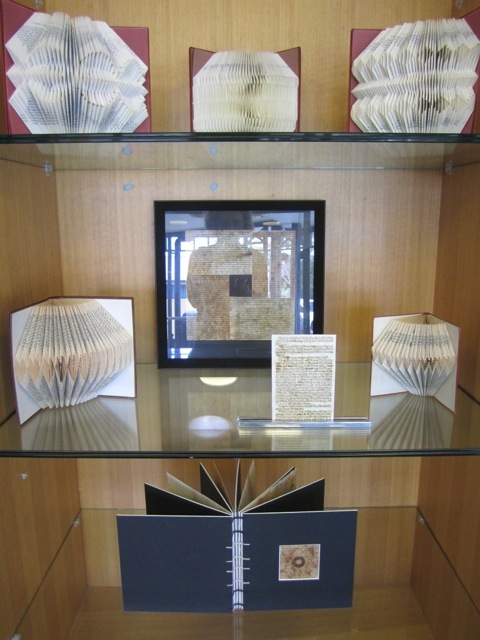 Barry and I are lucky enough to have our pieces in the Library's foyer gallery space at the moment. The Library is a busy place and and its great to know so many folk will walk past our work, pick up our cards and have a good look over the next few weeks. 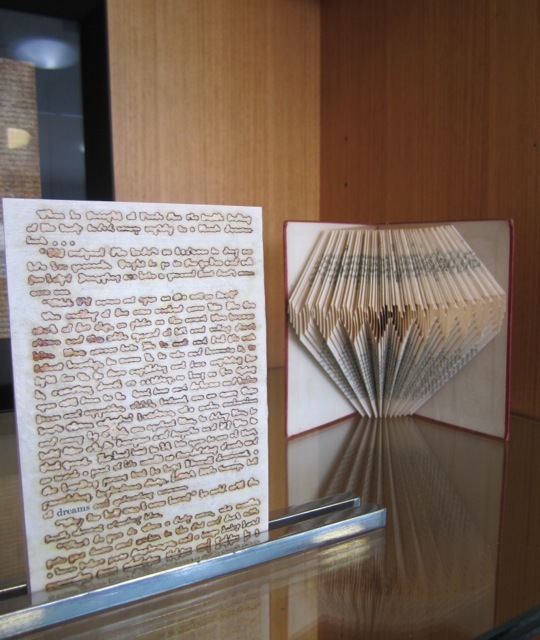 The general theme of my showing is using old books and making them beautiful again. 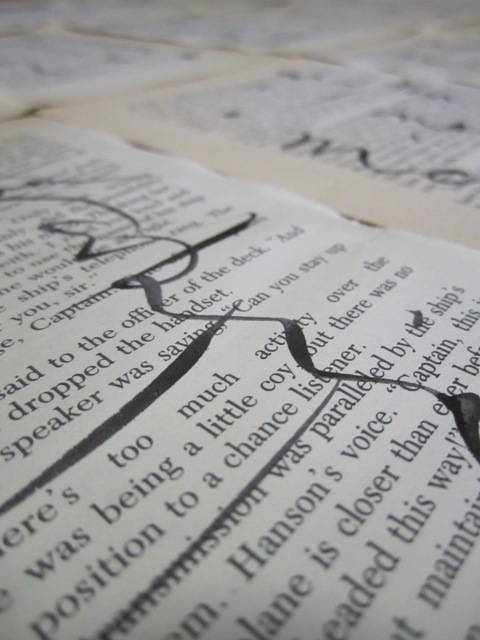 I have a couple of folded books; as well as a wall piece where I wrote over old pages and combined them with wax and drawing and rusty bits, as well as a page where I burnt out words and left a key word; and a book that has burnt out pages images throughout it as well. 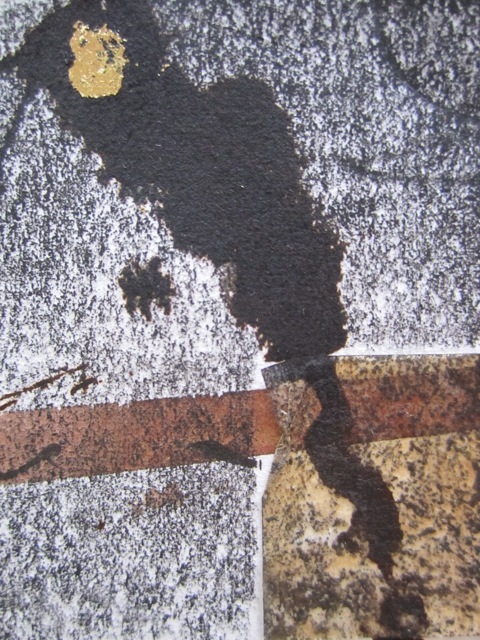 Here is a link to Barry's pieces on display - they work together nicely I think. I think it's great to offer art up to folk in spaces other than galleries - so many more people get to see and look and hopefully be inspired... so here's to all the small spaces and places that support artists!